Senator Marco Rubio (RINO-FL) has proposed a big, new entitlement program to provide paid family leave for every parent of a newborn baby. The technical solution is to let parents withdraw their social security benefits ahead of retirement; when they get old, they compensate the social security system by waiting longer with retirement. As I explained recently, there are so many things wrong with this proposal that it is difficult to understand how the good senator from the Sunshine State bought into it in the first place. It does not help that it originated with Independent Women's Forum, a conservative think tank. 1. It opens the door for other friends of big government to expand the program exponentially, to cover all kinds of paid leave. 2. Since the proposal does not come with any new tax, it taps Social Security for billions upon billions of dollars when the system is already running in the red, and will go bankrupt in about 15 years. As for the first point, neither Senator Rubio nor the IWF appear to have done their research on what paid-leave programs look like in other countries. They seem to think that if you just create a "small" paid parental leave program, nobody will every come up with other forms of paid leave to tuck onto it. In the real world, outside the District of Columbia where Senator Rubio and the IWF live, there are paid leave programs for caring for a sick child, caring for a relative, personal sick leave, workforce sabbatical... As I explained in a paper last year, the cost for the Rubio-IWF entitlement program could easily run into the hundreds of billions of dollars per year. Even if the program is not expanded into other forms of paid leave, it would still shorten the life of Social Security by at least three years. It is inconceivable that a U.S. senator would come up with an idea like this, so close to the death of America's largest entitlement program; there are only two explanations: either he is monumentally ignorant, or he believes that this could be a door opener toward "saving" Social Security by means of major tax hikes. 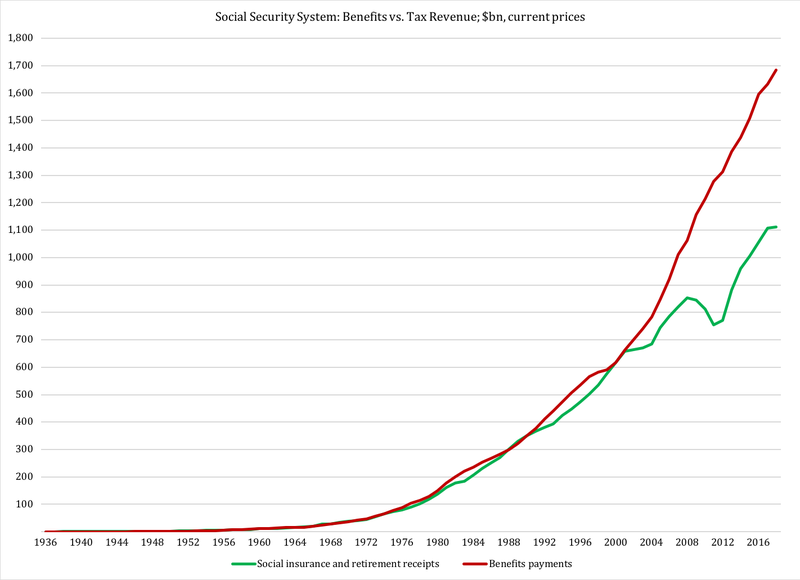 a) Republicans in Congress want to save Social Security with massive tax hikes. b) Republicans in Congress know that their voters will go bonkers if they propose large tax hikes, even if it is to save Social Security. c) Republicans in Congress think their voters can be bought. d) Hence, Republicans in Congress come up with a shiny, new entitlement program to dangle in front of their voters with the left hand, so that the same voters won't notice that the same Republicans take more money out of their pockets with their right hand. When viewed in this context, Senator Rubio's proposal makes a lot of sense. Hopefully, there are other Republicans in Congress who will stand up against this idea - and, even more important, voters out there who will put their foot down and say they have had enough of Congressional fiscal recklessness. 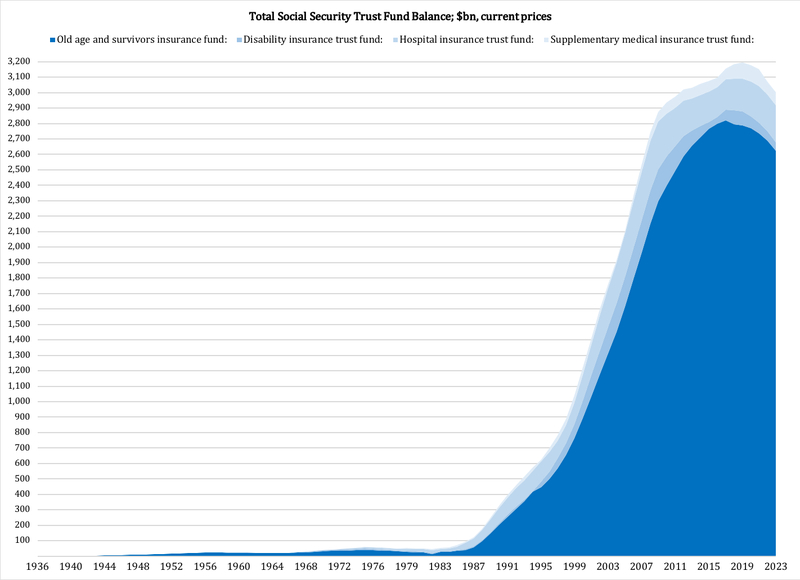 No later than 2028, benefits paid out will exceed the entire balance of the Social Security system's trust funds. 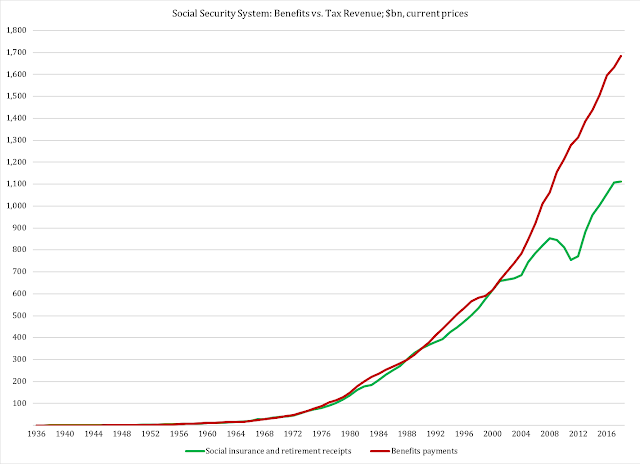 Since there will still be tax revenue coming in, the system will only use part of its fund to finance benefits. However, the Social Security Administration itself has predicted that the retirement fund will dry up by 2034; the other funds - the minor parts on top of the retirement fund in Figure 2 - may or may not carry on for some time. It is very difficult to imagine that Senator Rubio has not figured this out. After all, the information is not farther away than three minutes and three clicks on the internet. Therefore, the most likely explanation is - again - that Rubio sees this program as a way to ease resistance among Republican voters to major Social Security tax hikes. Already before the Trump tax reform, the personal-income tax burden was heavily concentrated: one quarter of all taxpayers, in other words those who make more than $100,000 per year, paid 80 percent of all personal federal income taxes. Since personal federal income taxes, and the social security taxes that come on top of them, account for 80 percent of all federal tax revenue, this group pays about 64 percent of all federal taxes. 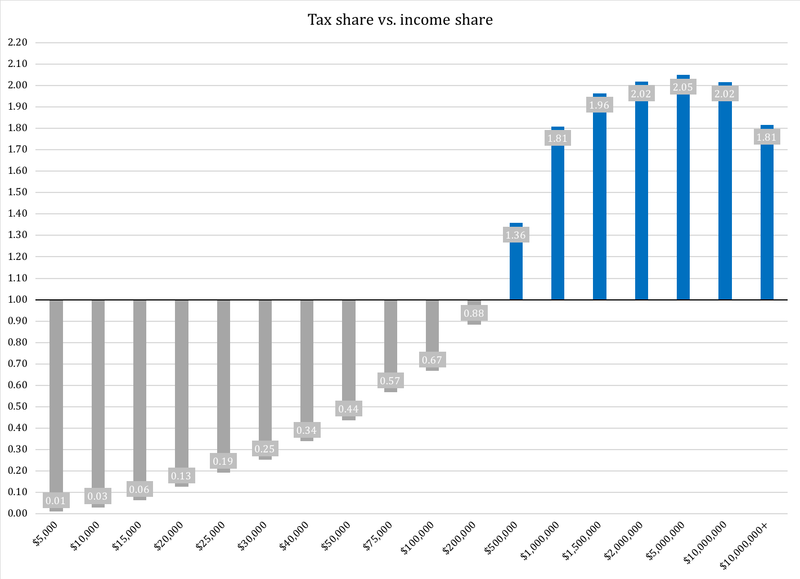 This concentration of tax burden has increased with the tax reform; while good on the corporate side, the reform left much to be wished for on the individual side of the income tax code. This is a problem generally, but even more so for Senator Rubio, who has to ask himself who should pay all the taxes he will need to fund his shiny, new entitlement program. Is he going to increase taxes on higher incomes? They already pay a disproportionate share of all taxes. It is not until you earn somewhere between $200,000 and $500,000 that you start paying taxes in proportion to your income. Then, on the other hand, the tax burden rises much faster than your income: by $5 million, you are responsible for twice as much taxes as you should be if the income-tax burden was distributed fairly. What income brackets in Figure 3 does Senator Rubio want to burden with more taxes to pay for his shiny, new entitlement program? Or is he going to try to push it through Congress and then leave it to future legislators to clean up the fiscal mess? That if anything is a recipe for a fiscal disaster of Greek proportions.